My copy of Faceless Killers is littered with snippets of praise, both for Mankell in general and for the book in particular. “Sweden’s greatest living mystery writer!” (Los Angeles Times). “An especially satisfying crime novel” (Wall Street Journal). “A thriller of the very best kind.” (The Times [London]). “Beautifully constructed plots.” (New York Post). “An excellent thriller…A terrific novel.” (The Independent [London]). At 4 p.m. that afternoon Wallander discoverd that he was hungry. He hadn’t had a chance to eat lunch. After the case meeting in the morning he had spent his time organising the hunt for the murderers in Lunnarp. He found himself thinking about them in the plural. For the next three days nothing happened. Naslund came back to work and succeeded in solving the problem of the stolen car. A man and a woman went on a robbery spree and then left the car in Halmstad. On the night of the murder they had been staying in a boarding house in Bastad. The owner vouched for their alibi. He gets the job done, but do reviewers really have such low expectations for crime fiction qua fiction that something so flat gets so much praise? Perhaps the “very best kind” of “terrific” thriller doesn’t need great prose, just an interesting and well-constructed plot (a double-standard, of course, as if genre fiction should not be expected to be well written in every respect). How good is Faceless Killers by this measure? It’s fine, I guess. By the end the necessary information has been gathered and the pieces fitted together. Because it’s a procedural, solving the case is a matter of following along as the police do their job, which necessarily makes us more passive as readers–we have to wait for their discoveries to be delivered to us. Lots of very good crime novelists use the procedural form–as P. D. James has pointed out, nowadays it’s really the only way to write realistic mysteries, after all. A procedural can become rich and interesting if the contexts and the characters are developed enough and the police’s discoveries aren’t all strictly literal. Cases can be devised that draw both detectives and readers into new territory–social, political, intellectual, even philosophical. And the detectives themselves can be made multifaceted, and have plot lines of their own, so that the case under investigation becomes a device for personal exposure or exploration as well. James, of course, does all this brilliantly (think of A Taste for Death, for instance), as does Ian Rankin (whose last three Rebus novels in particular deserve to be called ‘condition of England’ novels), and sometimes Elizabeth George (Deception on His Mind, I think, is one of her most interesting). Faceless Killers reads like a thin version of, say, Rankin’s Fleshmarket Close. Wallander is a close cousin of Rebus (and not too distant from Peter Robinson’s Inspector Banks)–which is not to say that Wallander is derivative (if I have the chronology right, they are basically contemporaries), just that with his divorce and his drinking and his depression, he seemed formulaic, another in an already well-populated group. Over the later books in the series, perhaps, he distinguishes himself in some way besides his fondness for opera. The crime is very violent, and described very graphically, and there are some intense action sequences in the novel. I suppose this is why some of the reviewers call it a “thriller” rather than a “mystery.” I don’t enjoy that kind of reading very much: I’d rather be drawn in intellectually than manipulated through fear and suspense. This, I recognize, is basically a matter of taste, though I think that it is worth asking if different kinds of preferred experiences might in fact be more or less valuable, or whether we ought to seek out or encourage preferences that pander to our baser nature rather than our higher! (Look, for example, at Wayne Booth’s comments on Jaws in The Company We Keep, and ask yourself “who am I being, what am I desiring, as I go along with this kind of story?”) Here I think Mankell’s dull style is actually a good thing, because though grim, his violence is not really sensational–it’s just there, and then we move on to the next thing. The case does touch on some broader issues, particularly xenophobia and tensions over immigration. Again, though, the treatment seems perfunctory: we don’t spend time among the asylum seekers in the camps, and the central crime turns out to be connected only incidentally to the racial tensions it stokes. Probably the most distinctive feature of the book, for me, was its atmosphere, a relentless cold heaviness. Things just always get worse, and then there’s more sleet and snow. Who wouldn’t want to spend hours immersed in that? 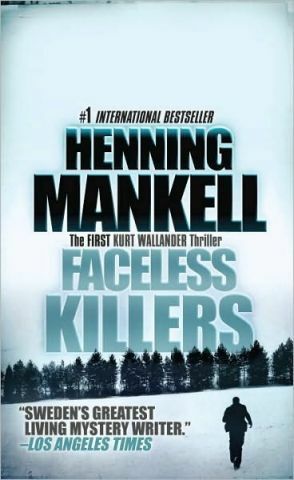 I read Faceless Killers for a couple of reasons–first, because Mankell is such a big name now that I figured I should have some first-hand experience, and then because I would like to broaden my course reading list by adding some ‘international’ authors and Scandinavian crime fiction is very hot right now. If he bumped anyone from my usual list, it would be Ian Rankin. Right now, though, Rankin wins: he’s just a better writer. The question is, should I (must I?!) read more Henning Mankell to be sure. Suppose I read one more, to see how much better he gets: any recommendations? I’m not in any real position to comment, because this is the only Mankell book that I’ve read as well. I suppose the fact that I haven’t felt compelled to read any more perhaps makes a comment for me. My only caveat is that this is the first in the Wallander series (I don’t know if it’s his first book, mind you) and the early Rankin were not that brilliant either. Perhaps we ought both to try one from later in the sequence. A fair point, though the Rankin I’ve been teaching for years is Knots and Crosses, which is the first Rebus, and though not as broad and complex as later ones, it is still very smart and very literary. Hmm. I don’t think I would disagree with anything you wrote, but when I read this I did like all of that heaviness and sleet and snow, so I enjoyed it despite its flaws. It made me want to give Mankell another try and I moved on to the second Wallander—I recommend you stay away from it if you do read another. I just felt extremely ambivalent about him after that one, but I still “want to believe” so I wonder if his later work might not be better. I may have mentioned this before, but have you tried Andrea Camilleri? His novels are no less serious in terms of their thematic material, and the weather and food are rather different than in Mankell. Rohan, you are one of the very few bloggers I would ever dare raise this issue with, but do you think that your own cultural conditioning has any impact on your reading experience here? I read the book and wasn’t blown away by it (I was dreading it, and it was better than I feared – the frame of expectations is so influential, isn’t it?) But I read it as fully intending to be an affect-free voice of profound melancholy. There is a European tradition (in which Marguerite Duras occasionally sits) of ugly, grinding prose, empty, bleak, futile. This is the narrative voice, and Wallander is fully in that melancholy position, only he does have a quiet, persistent passion for his work, a compulsion towards justice that drives the story forward, despite the readerly fear that everything might just wither and die and we’ll all be left with our heads in our hands. There is a continual fight against apathy and indifference and selfishness. To me, and I recognise the presumptuousness of even discussing such things, this is wholly anti-American. I’ve been surprised by several of the big name American authors I’ve read lately and their determination to pull a happy and uplifting ending out of the most unpromising material. Plus, reading around the blogosphere, I find Americans get quite angry and fed up with books that don’t show protagonists who try hard, who seek happiness, who practice gratitude. Now this could be a false correlation, based on an unrepresentative selection. But Scandinavian crime really is dark, and often the prose is plain and unembellished as, I think, an acknowledgment of that fundamental darkness. I read a Karen Alvtegen novel and it began bad, and got worse, her hopeless, horrible characters behaving in ever more terrible ways, and by the end as suicides piled up and lives were ruined, I started laughing because it was almost a parody of itself. This is not the first book I would send to American blogging friends in the hope it would seek their approval! But as I say, I could easily be wrong here and would be interested to know what you think. And of course, a reader might just not like affect-free prose and that would be fair enough in any case. @Amateur Reader, I don’t recall that name–I’ll make a note of it now, for sure. @Litlove, I think these are fair questions. I’m interested that you think they might be awkward ones, in fact! We should all, always, be ready to reflect on the factors that influence our reading and our judgment of what we read. I do think I’d want to kind of take apart some of the different issues you raise–starting with pointing out that I’m not American, but Canadian, but then adding that I think my reading sensibilities are more British than either. I don’t think it’s “cultural conditioning” exactly that’s at stake so much as reading habits and experience, and academic training. But then, of course, there’s personal taste (which may be where the unconscious effects come in that you have in mind when you say “cultural conditioning,” of course). As a professional reader, I am accustomed to setting aside my preferences and doing my best to appreciate books or authors for what they do, even if I don’t like it. Otherwise I’d never teach Hardy (speaking of “fundamental darkness”–and also wooden prose)! So I might yet come to terms with Mankell in this way, even though I may not come to see him as an author I’d seek out by choice. This is not to say, though, that I think personal taste is inviolable or inexplicable, or should not be scrutinized. You mentioned the melancholy European style in our discussions of The Summer Book too. But I really liked Jansson’s book–especially because it did not fall into a “happy and uplifting ending.” That’s not something I look for or demand from my reading. (My favorite novel, Middlemarch, is actually a very melancholy book, as some contemporary reviewers complained–though it is hardless hopeless, and never grim.) I think you’re right that there is pressure in that direction in mainstream / popular American fiction, and the results can be kind of nauseating (The Lovely Bones, anyone?). But I don’t think relentless darkness is necessarily a better principle. Jansson’s book is leavened with humor and humanity in a way that Faceless Killers is not. Karen Alvtegen is on my list of Scandinavian writers to investigate–you haven’t exactly encouraged me to track her books down! In any case, I’d want to separate the issue of depressing vs. uplifting stories from the question of literary style, or quality of prose. How much is the lack of affect purposeful and how much is it the result of a literal-minded translation? If indeed Mankell is participating in the tradition you describe (“ugly, grinding prose, empty, bleak, futile”), he’s doing it pretty well. Would I like this kind of writing if I read more of it? Maybe. Do I want to read more of it? I’m not convinced! There are just too many other books to read, melancholy or not. Rohan – what an interesting response and so much to think about. I do think these sorts of questions can be awkward because, taken the wrong way, it can sound as if there’s a problem of insularity, or insufficient breadth of reading, or some such. I feel able to ask you what you think only because I know you have the sort of academic training that means you probably don’t instantly assume this kind of debate to be wedded to the personal! I am no greater fan of melancholy darkness than you, but I guess I feel it exists on a spectrum, as all these things do, with Jansson at the southernmost, sunniest tip (it was a nostalgic, charming book about a loving relationship) and Wallander at the northermost chilly pole (brutal killings with xenophobic implications). I suppose for my own part I’d feel unwilling to judge whatever principle lies within a work as better or worse than another – as you say, there are things we ask for in our pleasure reading that can be put aside when we consider books more academically (I would never touch Holocaust literature if I had a choice in the matter, and yet I always seem to end up teaching it – how can that be???!). As for questions of translation, well there I have no idea, but I suppose I expect a modern translation to be accurate if not exactly soulful, and a bad translation to be give itself away by being patchy. But that is speculation on my part. And I don’t know much at all about Scandinavian literature; I’ve read Ibsen and Kierkegaard, and again, whilst this may indicate a particular tendency, one trait certainly cannot account for all the richness of any national literature! But I suppose what I’m interested in is this certainty I have that as academic critics our foremost job is to challenge our own readings and wonder where they come from and what influences them. Maybe it’s impossible, and maybe it’s just too dug down into unconsciousness. And yet I feel in reading, where there is absolute freedom of mental and emotional response, it is possible to see oneself more truly, if fleetingly, than anywhere else in life. I began as an academic fascinated by how my gender affected my reading (and that of other people) and, a British obsession this – how my class did, too. But I say all this and, given that I did not realise you are Canadian! !, I am barking up the wrong tree in any case! But I certainly think you should read and teach what you connect with best and find most fascinating – as you so rightly say, there are just too many good books out there not to do that. Wallander is getting that idea of effaced personality from Maj Sjowall and Per Wahloo, the couple who wrote the 10-volume Martin Beck series in the 60s and 70s. Committed Marxists, Sjowall and Wahloo only ostensibly organize the books around Beck–it’s really the whole system of the police, and indeed Swedish society as a whole, that is at the center of the books. The first one in the series, Roseanna, is pretty terrific, IMO, and might make an even better choice for you if you want something international for your course. To me, it’s interesting to compare Mankell to S & W, since they are clearly touchstones (and he’s written an intro for the newly released US edition explaining his interest in their work). But Mankell either can’t or won’t be quite as detached or structural in his way of proceeding. Wallander has more star power, if you will, than Beck. Mankell’s books are, for me, much more suspenseful than S & W’s (particularly further into M’s series), and I wonder how much that suspense is tied to a different (more individuated and, in literary historical terms, more realist) sense of character. I think Manell agrees with S & W that Sweden is a society that needs to examine itself more closely. I like what Mankell does in Faceless Killers by undermining Wallander (and perhaps the reader’s) distrust of the immediate anti-immigrant response to the crime without conceding to that way of thinking. I think he asks tough questions about whether so-called multicultural democracies are able to handle difference (as opposed to diversity). And like Litlove I kind of get off on the darkness and the snow! What great and thoughtful comments. This is the best thing about blogging; there’s nobody around who will think these things through with me in person! Litlove, no worries. It’s just that insisting we are not American is a major part of the Canadian national identity! I think we disagree about whether it is possible to judge the value of what principles motivate a given work (and I doubt that you really take that theory all the way–I feel reasonably certain that we could find some works you’d be quite unwilling to accept on their own terms)–but we agree that that kind of judgment is not what guides us as scholars and teachers. How far it guides us individually as readers becomes more complicated. How far are we obligated, in that role, to press past our personal boundaries? Some, I think, because it’s not just as professionals that we need to be self-critical and self-aware, and to test our own assumptions. For me, Mankell is a kind of borderline case, since I was reading Faceless Killers out of personal interest, but also with an eye to work. Dorian, I’m not “selling” Mankell yet, of course, short or otherwise, having admitted that I can’t really make any firm judgment on the basis of just one book. But the context you suggest is really helpful to how I’ll think about what to do next, especially the information about the Sjowall and Wahloo series. Also, I agree about sometimes finding the detail in Rankin and Robinson a bit much (I tolerate it better in Rankin, though I couldn’t really say why). Your phrase ‘effaced personality’ is a very nice way of describing the Wallander effect, and I take your point that having the crime not turn on the xenophobia theme could be read as a strength. Seems like what I should do is read more! I’ll look up the Beck books, and I’ll head towards some later Mankell. Having tried to emphasize, in my response to litlove, the difference between reading for work and reading for pleasure, I will add that often if I work a little at something, I come to take more pleasure in it–not necessarily because my taste adjusts, but because I get better at seeing what’s there and appreciating it for what it is. But I hate the darkness, and the snow. I get enough of it here in dreary Halifax–while in my real hometown of Vancouver, it’s spring already. I have a friend who is Portuguese and she would murder me if I forgot myself so far as to even hint at a link to Spain, so I feel I have got off quite lightly in this instance! I quite agree that reading S & W would be a better way to proceed than more Wallander in the first instance, and I’m also thinking of Miss Smilla’s Feeling for Snow, which was the Ur-Scandinavian crime novel (of course you may have read that already). I don’t think it will go light on the snow, but it may nevertheless be not quite so very dark. I’m noticing now how very differently I view books if I am going to teach them, as opposed to when I read them for pleasure. I am quite struck by how much my reading frame shifts. There are books I have read for work – Robbe-Grillet, Derrida, Nietzsche, Houellebecq – that I have even enjoyed that I don’t think I could have got through for my own sake. I’m actually feeling a bit Jekyll and Hyde considering it! I think, generally, that what distinguishes books from all other media is that they invite us to be wise. Not even art house cinema can have that effect (the visual dimension is always too huge and invites us primarily to submit to spectacle). I think this is the enormous strength of books but also their problem. Being entertained does not necessarily always go in hand with being instructed, or invited to reflect profoundly. The reader can be thrilled on both counts (learning and pleasure) but also fed up because one or other is missing. As a general reader, I find it hard to push myself beyond my comfort zone, but in teaching mode, it’s precisely the pushing that’s interesting to me. That may just be weird, though! Last night I found that Roseanna is available through Kobo so I’ve already got it downloaded to my iPad. How’s that for getting right on it? “they invite us to be wise”–I love the way you put that. I wonder if that’s why I get so irritated with people who adamantly refuse to think about their reading or demand more of it. Sure, not everything we read has to be substantial, and we don’t have to be wise readers at every minute, but what an invitation to turn down repeatedly! RM–very curious what you make of Roseanna. And litlove–your distinction between what one reads for pleasure and what one reads for work certainly resonates for me. As you & Rohan intimate, there’s something kind of great about the distinction, if we can take it as evidence that reading in the communal critical context of the classroom might be different in kind not just degree from reading we do alone. I always tell my students that there’s something important that we do as a group that we couldn’t do by just reading the texts on our own. Hi, this is a bit late, but might interest you. May I recommend the Swedish crime writer Maria Lang to you? She began her career in the 1940s, and really was the linchpin between Agatha Christie and Scandinavian crime writers. I believe she was the first of these. Interestingly, while she had the stock inspector type who solved the crimes, he was associated in the early books with a young woman named Puck who often came up with brilliant insights that set the inspector in the right direction. Gay characters also appeared in Swedish literature for the first time, (I think), generally living a positive life together. I think Puck got replaced after about book three, and another female “based on the author” replaced her. I haven’t read any of these as their reputation is “too formulaic” and, who has the time? The first one, It isn’t only Murderers who Lie” has been translated and is well worth reading.